In an era of “fake news”, the line between journalism and fiction can appear a little blurry. Consider the last news story you read: who wrote it, and why? Who funded it? What racial and/or gender dynamics were implied or explicit? If we understand journalism as a zone of public conversation, what “public” was included in that conversation? What was the story behind the story? As a fellow at the Latino Research Initiative, Dr. Vigil draws on communications theory to understand literary texts, focusing on questions of gender and sexuality. Her work in progress, entitled Public Negotiations: Gender and Journalism in U.S. Latina/o Literature, explores how contemporary U.S. Latina/o authors use literary texts to create and also contest a Latina/o public. For instance, Oscar Zeta Acosta’s Revolt of the Cockroach People (1973) and Lucha Corpi’s Eulogy for a Brown Angel (1992) each portray the story of martyred Chicano journalist Rubén Salazar. However, Acosta’s novelistic account of the movement aligns the journalist with some of the most militant activists of the time, effectively endorsing masculine norms in journalism. Alternatively, Corpi’s text juxtaposes Salazar with a fictional, sexist journalist. In doing so, she presents a vision of a more heterogenous, egalitarian Chicana/o activist community, one in which more feminine tactics of resistance (e.g., negotiation) have their place in the story. Dr. Vigil’s current research stems, she says, from a love of journalists and an interest in the often conflicting roles of reporting and activism. Previous research on creative resistance to U.S. political interventions in the post-Vietnam era led Dr. Vigil to the work of such journalists as Francisco Goldman and Hector Tobar, both of whom also write fiction. The question of journalistic objectivity emerges often in Dr. Vigil’s research. For instance, in Cherríe Moraga’s play Heroes and Saints (1994), the reporter Ana Pérez eventually abandons her position as a reporter for a mainstream station to join grassroots protesters. By crossing the line from reporter to activist, she challenges the assumption that Latina/o media representation will lead to Latina/o public power. Dr. Vigil notes parallels to current Spanish-language media programs in the United States, which, in addition to reporting on anti-immigrant legislation, editorialize on and oppose that legislation. 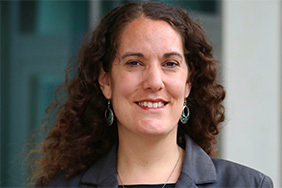 The Latino Research Initiative Fellowship Program offers scholars like Dr. Vigil the opportunity to focus on writing and research, access to a world-class library system including the Benson Collection, and a connection to what Dr. Vigil terms “a critical mass of experts” in Latinx and Mexican American studies.